Reports: Indicate the correct answers to multiple choice and true/false questions, and Socrative generates a report with scores for each student. Allow students to work through the quiz at their own pace or control the flow and timing of each question. Decide whether to display immediate feedback and explanations as students answer each question. Randomize question and/or answer orders. Disable the default prompt for student name. Share quizzes: Each quiz is given a unique SOC number. Give that number to any other teacher, and he can import your quiz to his account. 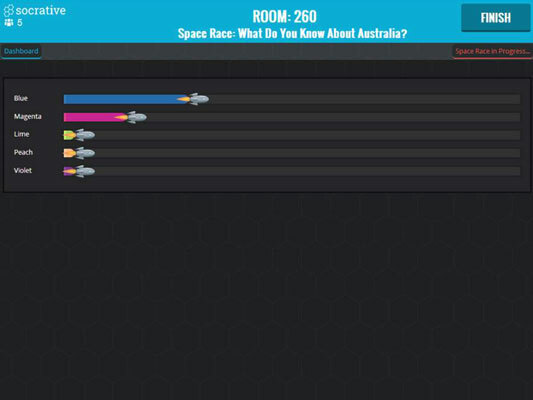 Space Race: Split the class into groups and select Space Race from the Teacher Dashboard. Each group is assigned a colored rocket. Select one of your quizzes, and group teams compete to answer the questions quickly and correctly as they advance their rockets across the screen. One last word on Socrative. Students love responding to quizzes but they also enjoy creating them. One of the best ways to master a concept is by being able to analyze it and ask good questions. Consider allowing your students to create quizzes once in a while.